Meeting reader’s needs requires editors and reporters to multitask, but the challenges are ratcheted up in today’s digital newsroom. Everyone is expected to be adept across the spectrum of news gathering— writing breaking news for the web and a more complete story for the print edition, taking and posting photo or video on the web, tweeting about a sports event or city council meeting, updating your Facebook page. I characterize it as organized chaos. Digital tools can be a great assist in collecting and distributing the news. They should not, however, replace the tried and-true methods for solid reporting. Best practices remain at the foundation of all effective coverage, no matter the platform. It boils down to setting priorities, then being organized to deliver. Here are a handful of elements—and accompanying digital tools—for ensuring your news product remains relevant to your readers and advertisers. Identifying news benchmarks for the next several weeks, even for the next year, helps you strengthen content and target opportunities to generate advertising and promote circulation. Digital tools allow you to share real-time calendars with news and ad staffs. Google Apps has a great calendar and other integrated services like email and chat for keeping up with what’s going on. Share Outlook calendars, too, so editors know the availability of reporters when fielding story requests and scheduling assignments. Likewise, meet early with individuals in charge of the events to discuss new approaches for coverage. Calendars should be routinely reviewed and communicated to readers. Tools like Basecamp, Mavenlink and a host of other project management tools can help schedule tasks as well as assign them and follow up. Designating one place to check all your tasks keeps everyone on the same page. Calendars are the first step in organizing newsrooms. Next, develop a communications plan. Several online forms and input tools make it easy for readers and advertisers to make you aware of what’s going on. Use Google alerts to keep an eye on news feeds. Take advantage of You-Tube and social media to promote events. Preview sports contests with taped videos from coaches. Elaborate on community recognition—citizen of the year, volunteer of the year, city festival royalty—by taping interviews with the candidates and linking to any of their social media accounts. Digital tools can enhance follow-up coverage, too. Any number of departments or organizations present annual reports—law enforcement, social services, parent advisory councils. Highlight one item in the mayor’s “state of the city” speech in the print edition and post the full text on the web. Produce a slide show of the community theater grand opening or fire hall open house. Provide a personalized tour of a new business via video or slide show, produced in cooperation with and paid sponsorship by the business. Instagram and Pinterest might work for niche audiences—and users who love photos. Consider using Instagram for on-the-fly coverage of fairs and parades. Consider a Pinterest board for the arts and crafts section of the paper/website where you could showcase events like art fairs. A word of caution: Don’t make the web a dumping ground for anything and everything, and make the content easy to navigate. Citizen journalists are a great way to supplement diminishing newsroom resources, especially for more in-depth projects. Enlist a panel of individuals who represent a demographic cross-section and have them provide online commentary on important topics such as the proposed closing of a school or the months-long election season. Create a Twitter hashtag to host town hall meetings. Online discussions also are an opportunity to introduce issues that may otherwise be shortchanged. Newsrooms, as a clearinghouse of information, are in a perfect position to lead the conversation—and think beyond your role of writing editorials. The web allows immediate exchange among readers. Monitor local social media including blogs, Twitter, Facebook and Instagram accounts, so you can follow, read, react and follow up. Provide links to other websites and blogs, but only after verifying them as credible sources of information or perspective. In a similar vein, you’ll want to set ground rules for social media accounts used by editors and reporters. All of these avenues provide a wealth of information that you can selectively share on your editorial page. A city council approves tax incentives for a shopping center after a months-long process that provoked emotions from proponents and opponents alike. A basketball team caps a perfect season with a state championship. A jury convicts a local resident of a triple murder after rumors and legal maneuvers captivate the community for two years. High-profile stories prompt prominent coverage at the various steps, but how many newspapers provide a chronological and comprehensive summary for those who have not followed the stories from beginning to end? Package the stories on the web rather than forcing a tedious archive search. You might even sell coverage as a special section or an e-book. Distribute blasts and alerts through e-mail, Twitter and Facebook, reinforcing that your newspaper is the first source for local news. Tweet key votes at meetings, sporting highlights, noteworthy remarks from speeches, and then promote the detailed print reports. Use live video to augment coverage of a press conference or breaking news. Make sure to look into possible uses for Virtual Reality storytelling in your publication. The New York Times is in full test mode with this new technology. 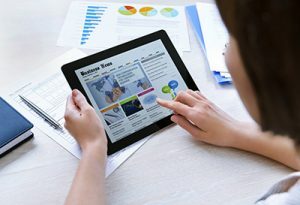 Today’s media landscape emphasizes open community interaction, but full use of social media does not happen on its own. Editors and reporters must manage these operations, too—the same people who have other responsibilities in collecting and reporting the news. How can newsrooms identify and celebrate success? Start a conversation with readers. They’ll let you know what’s working and what isn’t hitting the mark, what they like and what they think can be improved. Engaging in dialogue with readers is a win-win proposition for you, your readers and your community.